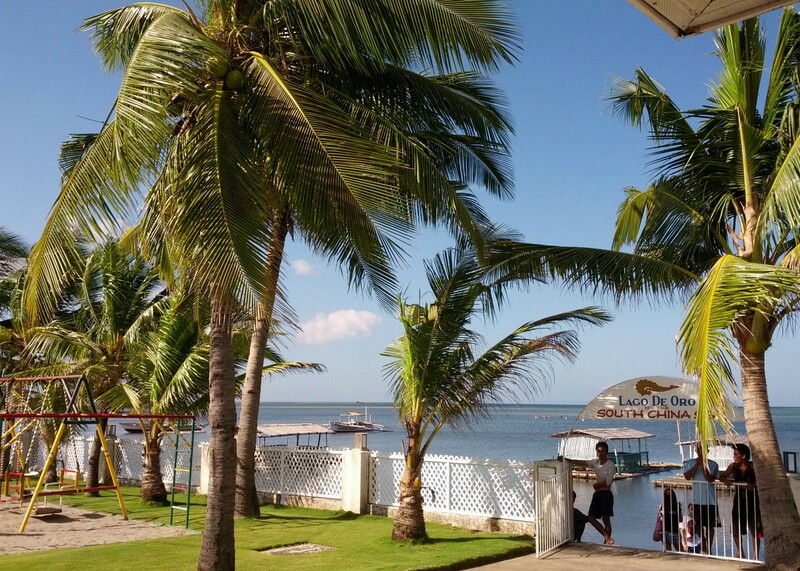 I spent the weekend in Lago de Oro with friends and already I want to go back. Aside from a vast pristine mangrove you can walk on taking the place of a beachfront, the resort offers an amazing view of the China Sea and a spectacular sunset. Most importantly, for me at least, the food did not disappoint. At first, I thought that the only thing we were going there for was wakeboarding. My interest however, grew a hundredfold when upon entering the gate of Lago, I was greeted by a sign saying that they make their own bread and bacon, among others. I simply admire restaurants that go that extra mile. As I expected, I ate so well there, to the point of guilt. It is funny, come to think of it now, that we were not expecting there would be good food in Lago. We even talked about finding some restaurant nearby to have dinner in when we got to Batangas. It is a good thing that we stayed. The first thing I ever ate there, at 4:45 PM and I have not had any lunch yet, was Gnocchi (Php335). Freshly made dumplings bathed in thick home-made Italian-style tomato sauce, Lago's Gnocchi was delicious. The parmesan cheese was served on the side which I found quite thoughtful. It also came with a basket of bread, freshly baked in the resort's kitchen, and some butter. Despite my hunger and the fact that it was so good, I thought the serving was good enough for two people. Now I regret not having snapped up a picture of that meal. Maybe next time... Definitely, next time. I did however, take a picture of our breakfast, which came with our accommodations package at the resort. My friends raved about Lago's home-made bacon, which are obviously heftier than the ones you buy from the grocery. I on the other hand, ordered beef tapa. Tapa is not exactly on Lago's menu, but the server told me that what they could do is boil away the sauce of the Filipino Beef Steak, leaving the beef. Perfect, I say, that is exactly how we do tapa at home anyhow. My beef tapa, as with the bacon breakfast, came with a choice of plain or garlic fried rice, toasted bread and butter, two eggs (I like mine fried with the yolk completely cooked. 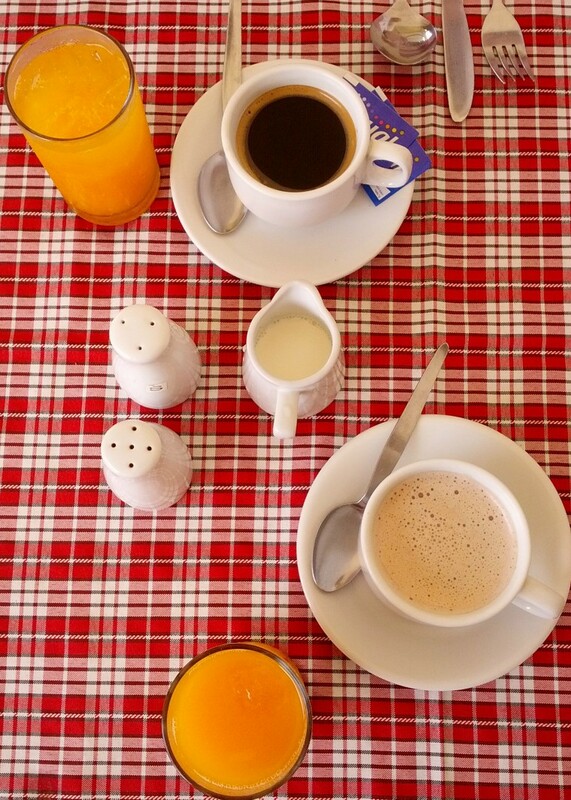 ), a choice of fruit juice, and a choice of coffee, tea, or hot chocolate. 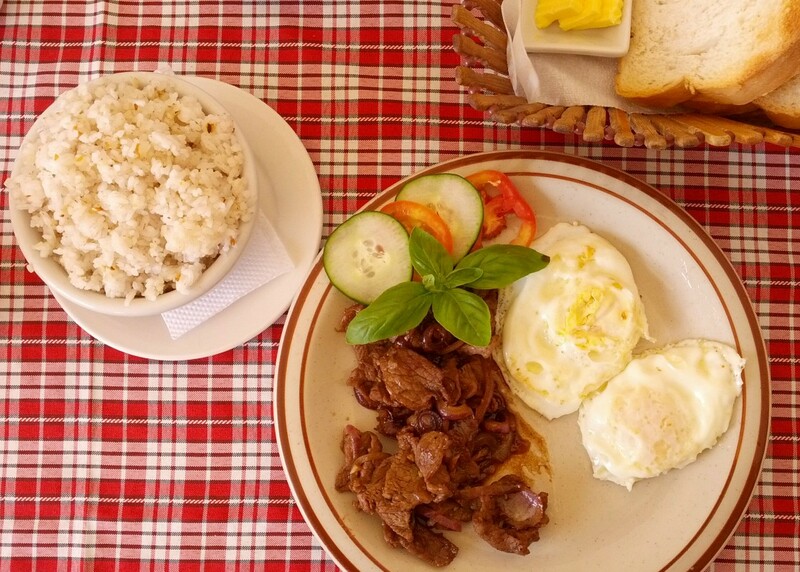 (I had my beef tapa with garlic fried rice and for drinks, I chose orange juice and hot chocolate.) The beef tapa came out great and I was satisfied with the amount of serving, which was quite generous. 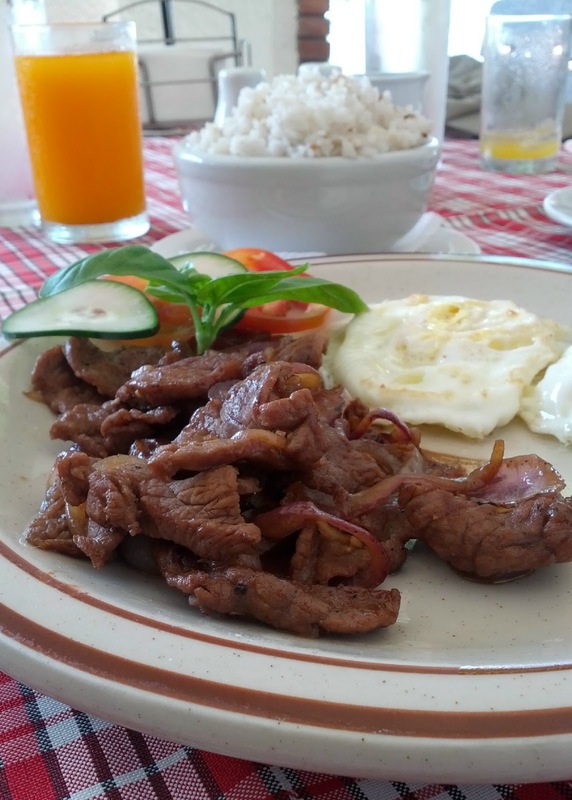 And because it is basically simmered down beef steak, it was not oily, making it a bit healthier than beef tapa. 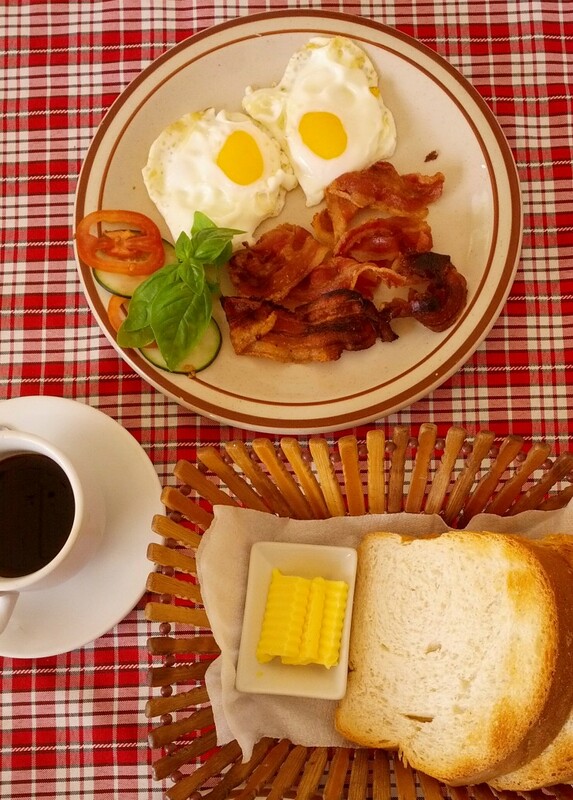 With a set breakfast as hearty as this, who needs buffet?